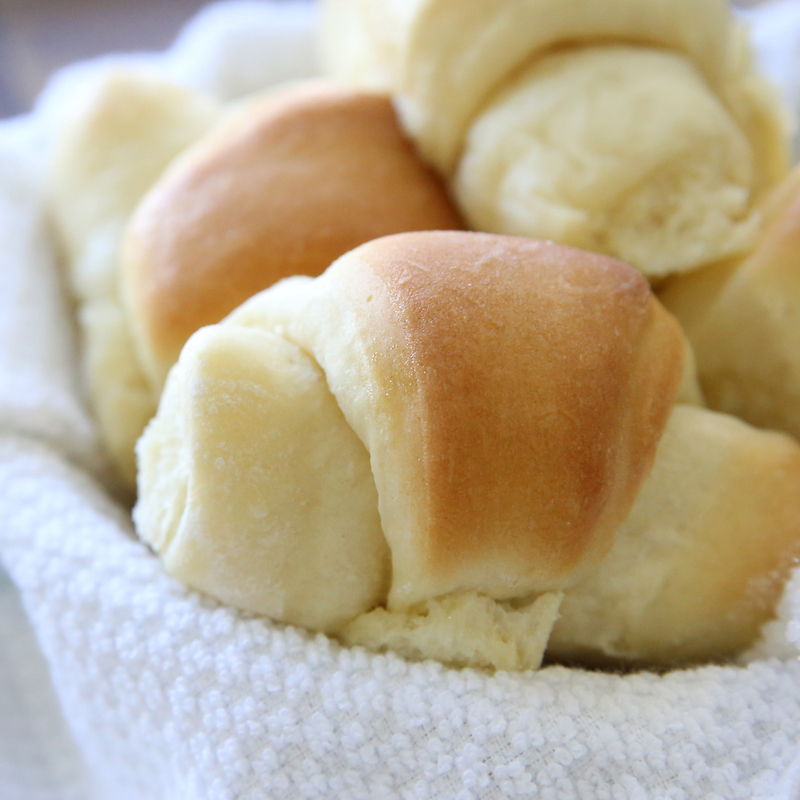 In today’s post: the best rolls you’ve ever tasted! Learn how to make amazing homemade crescent rolls for Thanksgiving or any other time you’d like to impress everyone at the table. Baking bread is one of those things that people think is really hard. I understand why it’s a bit intimidating, but honestly, it’s not that hard. Certainly not rocket science. I learned how to make bread in home ec in eighth grade, and if a bunch of eighth graders can do it, you can too. Plus once you show up at Thanksgiving with a tray full of these unbelievably delicious crescent rolls you’ll be famous. Seriously. I took my favorite dinner roll recipe and made it a little bigger for times when you need more rolls (24 big rolls instead of 16) and added an extra layer of butter to make these over-the-top amazing. 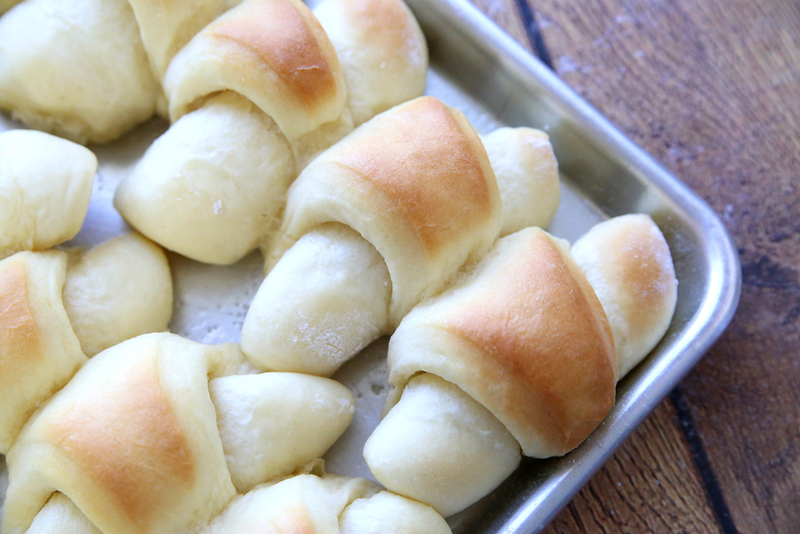 I promise you that store bought rolls just cannot compare with these. I make them for Thanksgiving and anytime I want dinner to be extra special, or anytime I feel like raking in the compliments. 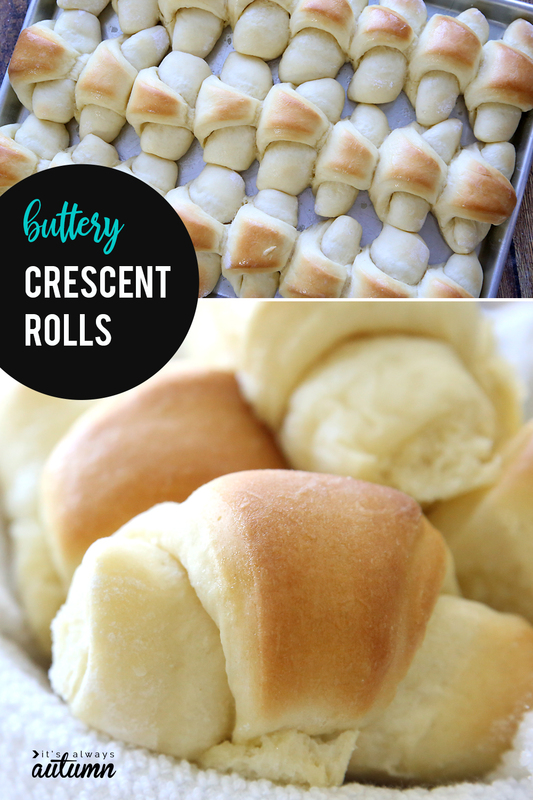 I’m going to walk you step-by-step through how to make these homemade crescent rolls so you can start raking in the compliments too! 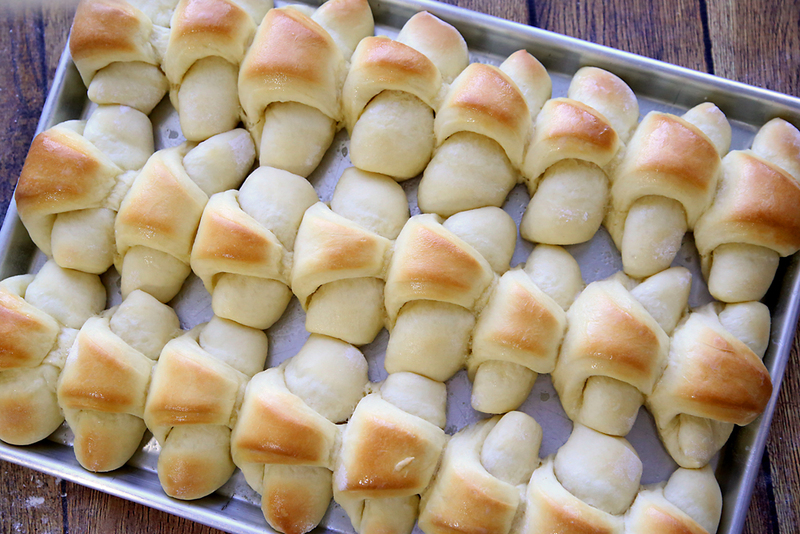 Next, watch this video to learn everything you need to know about making rolls. I explain about yeast and what kind of flour I use and how to know if you’ve kneaded the dough long enough and when it’s done rising, etc. The video is about eleven minutes long and it really does cover everything you need to know to make homemade dinner rolls. Please note that I made this video for my original dinner roll recipe, so the amounts mentioned in the video are slightly different from the ones on the recipe card above, since today’s batch of cresent rolls is larger (24 large rolls). At the end of the first rise, punch dough down and divide into 2 equal pieces. On a floured surface, roll each piece out into a 12 inch circle. Soften 6 tablespoons of butter and spread half on each circle. Use a pizza cutter to slice the circles into 12 equal slices (just like pizza). 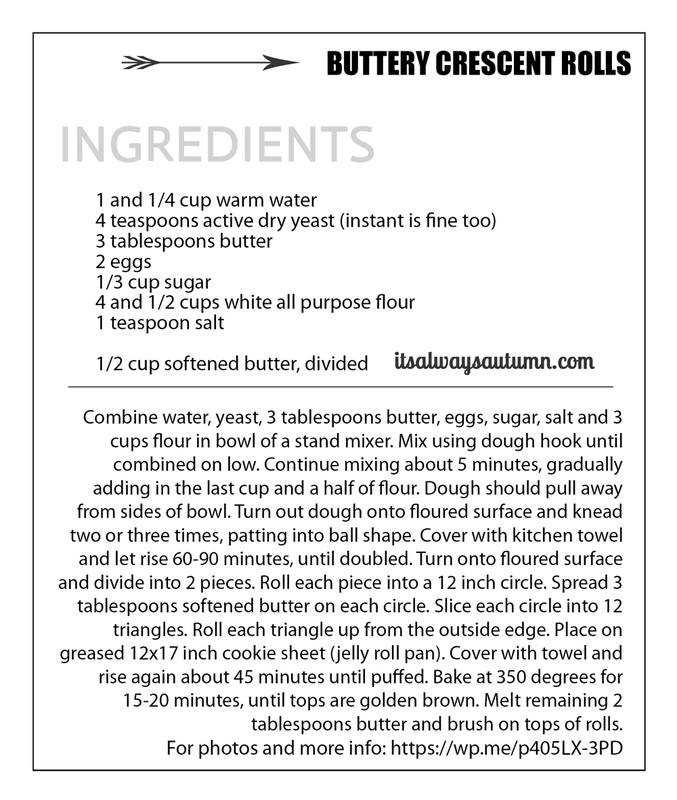 Roll up each triangle from the outside edge to form a crescent roll shape. Place all 24 rolls on a greased 11×17 inch cookie sheet with high sides (aka jelly roll pan). Allow to rise again for about 45 minutes, then bake at 350 for 15-20 minutes until middle sections of each roll are quite golden brown and edges are light golden brown. Melt remaining 2 tablespoons of butter and brush over baked rolls. I mentioned in the video that you can mix your bread by hand if you don’t have a mixer, and I even promised to give you some tips for that. And then I didn’t (sorry!). Click here for a really good overview of how to knead bread by hand. 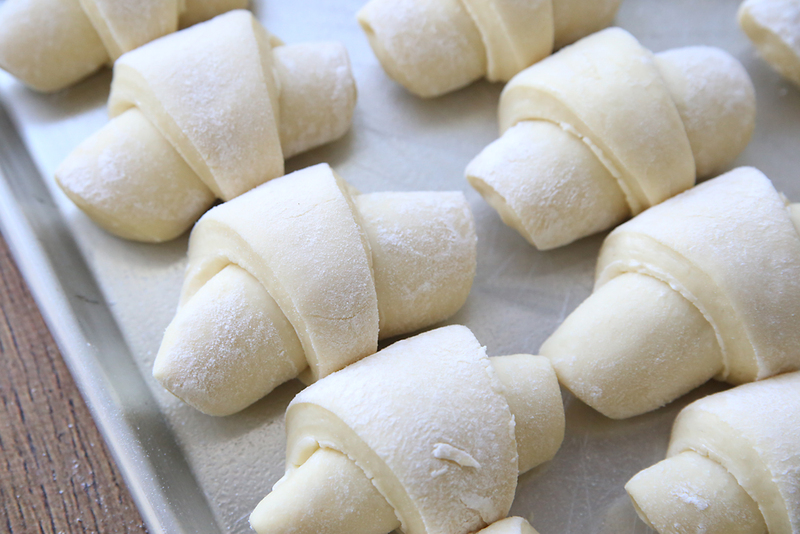 You can make the rolls ahead, up through the shaping step, and then freeze them to bake later to save time. Click here to learn how. This recipe is for white rolls. You can substitute up to half the flour with whole wheat flour if you’d like, but they will not be as pillowy soft. If you want to make 100% whole wheat rolls, you’ll need to find a different recipe. This recipe calls for 6 tablespoons of softened butter to be spread over the dough before rolling up – I actually usually use 8 tablespoons, or a full half cup. Either will work, but I’m of the “more butter is better” school of thought. Your bread recipes have never failed me. And I always get loads of compliments. Thanks for sharing another great recipe! I made several batches of these today for a church function. This recipe was so easy and they came out tasting so good! They weren’t all perfectly beautiful, but they will get eaten anyway! It was fun for me, because it was so long since I had made bread of any kind, and fun for my hubby because he got to eat some! Wondering if you have tried this recipe with Gluten-Free all purpose flour and it if will work just as good for this recipe? I would love to try and make these, but my daughter is gluten-intolerant, so I would have to use the flour mentioned above.